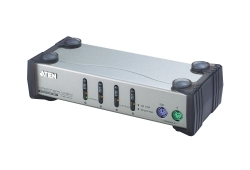 All our cables are double shielded to prevent RF Interference even in the most electronically noisy environments. All our cables use low resistance and low capacitance 24 gauge wire to ensure peak performance. 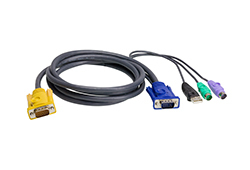 Our VGA cables comply with UL 2919 specifications. 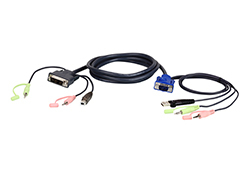 Our Keyboard and Mouse Cables comply with UL 2464 specifications. 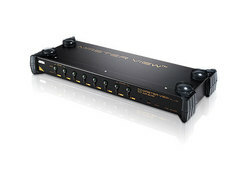 The cables that you use when connecting your computer to our MasterView KVM switches play a very important role in the quality of the communication between the PCs and the MasterView unit. Our custom made cables are designed to provide the highest signal capacity along with the lowest signal loss. What this means, to you as the consumer, is that you will receive the highest quality video output even in the higher SuperVGA video modes. An Average Cable Your average cable has one layer of shielding, a thin layer of mylar foil that has been cut into a very long and narrow, approximately one half of an inch wide, strip that is wound in a spiral pattern around the wires, also called leads, in order to reduce the cost of the cable. There are a few problems with this method of shielding a signal bearing cables, first and foremost among them is the fact that this wrapped foil method can "leak" RF (radio frequency) interference. Additionally the manufacturers of your average cables use very small wires to carry the information generally they use 28 or 26 AWG wires (in AWG the higher the number for the gauge the smaller the actual size of the wire) to carry their information, this is another concession to reducing the manufacturing costs of the cables. Some of your other "Premium" cables are made in the same way and with the same materials as your average cable. The manufacturers put fancy connectors on the cable then stamp the word "Premium" on the packaging and then charge you more for the cable. 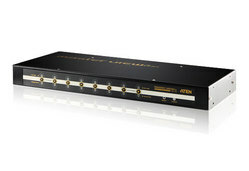 ATEN's Premium Cable At ATEN we have invested millions of dollars into cable manufacturing to ensure the highest quality cables at the lowest possible cost. Our cables are double shielded, beneath the PVC outer insulator you will find a copper braid RF shield, then beneath that you will find the mylar foil shield. Unlike our competitors instead of spiral wrapping the mylar foil shield, we take a single piece and enclose the signal carrying wires in a one-piece envelope. All our cables are manufactured with low resistance and low capacitance 24 AWG wires to ensure the best video performance. Another important difference between our cables and those of our competitors is that we use coaxial wires to carry the red, green, and blue video signals. Our competitors just throw the signal and its ground on two separate wires. 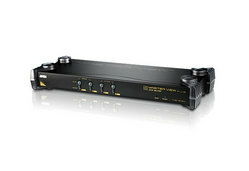 By using coaxial wires we reduce the possibilities of interference even farther. 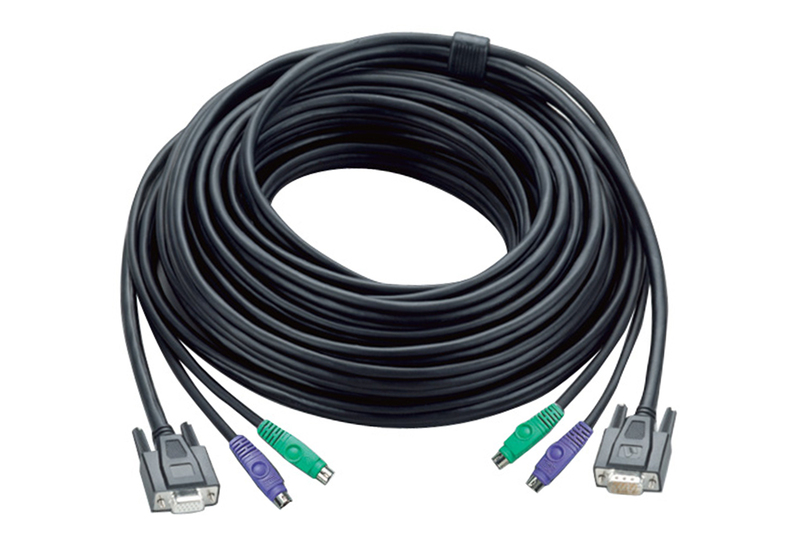 Our video cable is also built in compliance with standard UL 2919. 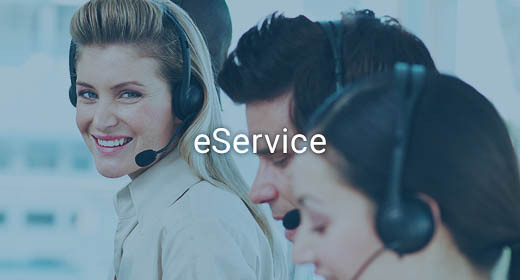 The cables we manufacture for our mouse and keyboard are also built to our high quality requirements and are in compliance with the UL 2464 standard.